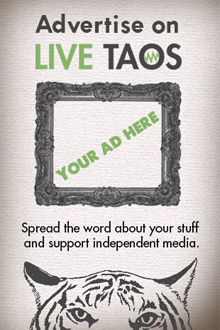 Thanks for submitting an event to the LiveTaos calendar! All events are proofed and approved by LiveTaos staff before going live, so don't worry if you don't see your event posted immediately. We do our best to make all submissions live within 24 hours (although it's usually much faster than that). Please search for your event before submitting it -- we do our best to stay on top of people's calendars, and may have already posted it! Note: If your event ends after midnight the time will change to 11:59 PM to conform to the event management system. Make a note in the Description if you want to include a later time. Note: Your event ends after midnight. The end time has been changed to: 11:59 PM. Make a note in the Details if you want to include a later time. If your location doesn’t exist in this list, please select ’No Location’ and include the venue name and address in the Details. Event descriptions are limited to 750 characters. It would help us immensely if you would include an image with your event posting.